How did you first hear about OYT Scotland? My wife and I have three sons — all of whom took part in separate voyages on Alba Venturer. We were taken aback by how much they had “grown up” after just one week aboard. That was about fifteen years ago — it took a while before I was able to look at volunteering. When did you first start sailing with OYT Scotland? In Spring 2009 I did an induction voyage on Alba Venturer. 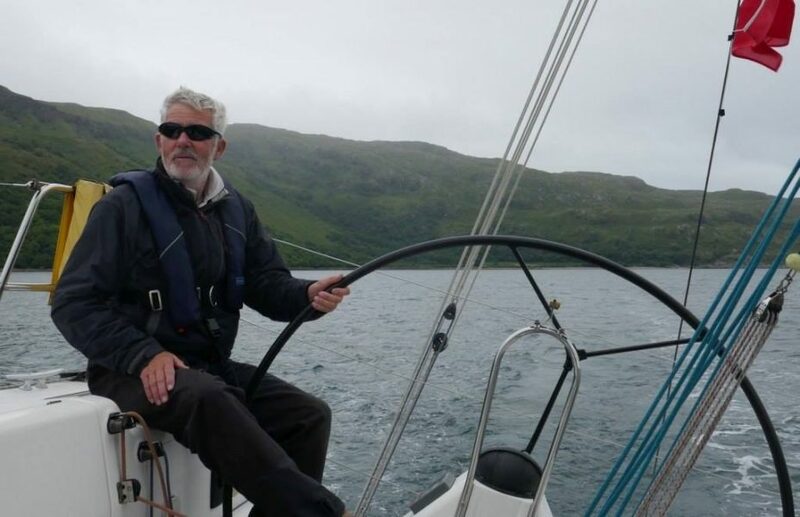 Later that summer I crewed on a fund-raising voyage on Alba Endeavour We sailed from Wick to the Lofoten Isles and back to Peterhead in ten days – I experienced what it’s like to be part of a watch. Over the last nine years I’ve moved up the ranks to become a volunteer First Mate. Two things come to mind – one was struggling back on hands and knees after a head sail change with young lad along the deck of Alba Explorer. Waves and spray were soaking us and running down our necks. I was worried about him and asked him how he was when we got back to the cockpit. He said, “ That’s the best thing I’ve ever done in my life.” The other was watching the reaction of two teachers on a recent CashBack for Communities trip as they listened to the young people talk about how their confidence and self esteem had grown in just five days. I was a GP in a fairly remote West Highland practice for thirty years until I retired in 2015 and I act as medical advisor to the Trust. I helped establish a sailing club in our village and as a Senior Dinghy Instructor I oversee our RYA training courses. With encouragement and support from OYT Scotland I have also qualified as a Cruising Instructor. Having just joined the board, I hope to help the organisation continue to offer life-changing experiences that is affordable to all — particularly to young people who for whatever reason have been underprivileged . I try to get out in the hills around our home in beautiful Lochcarron, I enjoy racing dinghies at our small club and I hope to get more time away on my own yacht in years to come.